NETWORK FINALS: After adjustment for football, DANCING WITH THE STARS dropped 0.2 to 1.1, and THE GOOD DOCTOR was down 0.1 to 1.1. CABLE HIGHLIGHTS: Prestige premieres continued to have a bad week, as AMC’s THE LITTLE DRUMMER GIRL launched its 3-night run at 0.07, despite a 0.25 lead-in from the movie CAST AWAY. The second night of HBO’s MY BRILLIANT FRIEND fell off the chart to 0.02/128K. ESPN’s MONDAY NIGHT FOOTBALL swamped Monday cable at 5.53, up 2.08 from last week’s game. USA’s WWE telecast was at 0.94/0.87/0.81, compared to last week’s 0.94/0.83/0.80. On VH1, LOVE & HIP-HOP dropped 0.08 to 0.91, and TI & TINY was down 0.04 to 0.51. On MTV, TEEN MOM was at 0.45/0.24, compared to last week’s 0.52/0.30. On Food Network, HOLIDAY BAKING CHAMPIONSHIP ticked down to 0.44, and CHRISTMAS COOKIE CHALLENGE was up 0.04 to 0.35. Bravo’s REAL HOUSEWIVES OF ORANGE COUNTY lost 0.11 to 0.44. ESPN2’s MAUI INVITATIONAL college basketball coverage was at 0.31. On HGTV, LOVE IT OR LIST IT shed 0.04 to 0.28, HOUSE HUNTERS rose 0.07 to 0.22, and HOUSE HUNTERS INTL was up 0.02 to 0.19. 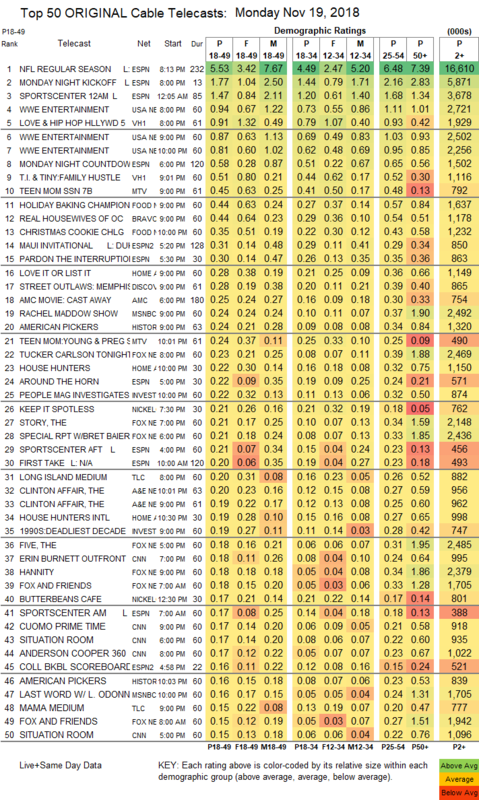 On Discovery, STREET OUTLAWS fell 0.08 to 0.28. MSNBC’s RACHEL MADDOW SHOW led cable news at 0.24/0.37/2.5M, with Fox News’s TUCKER CARLSON TONIGHT at 0.23/0.39/2.5M, and CNN’s ERIN BURNETT OUTFRONT at 0.18/0.24/1M. History’s AMERICAN PICKERS was at 0.24/0.16. On ID, PEOPLE MAGAZINE INVESTIGATES lost 0.08 to 0.22, and DEADLIEST DECADE was down 0.02 to 0.19. 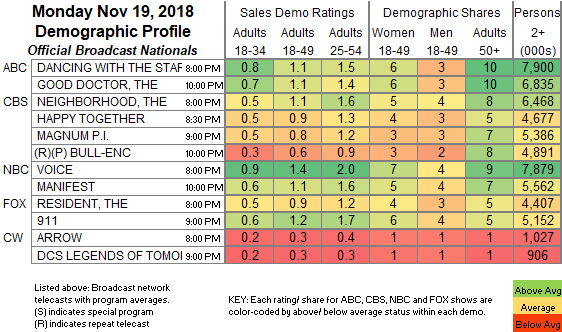 On TLC, LONG ISLAND MEDIUM slipped 0.02 to 0.20, MAMA MEDIUM lost 0.03 to 0.15, and LONG LOST FAMILY was down 0.05 to 0.11. Night 2 of A&E’s THE CLINTON AFFAIR was at 0.20/0.19.